Rude Vinyl has recently released their vocal house bomb, ‘In My Eyes’, on Döner Records and we got the chance to ask them a few questions. 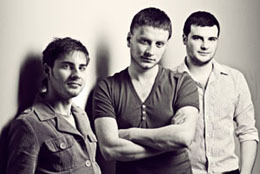 Our project is called Rude Vinyl, we are 3 guys from the capital of Moldova, Chisinau. Adrian Bogush and Andrei Casian are both DJ’s and producers, Lavrentie Panzaru is one of the producers as well as the manager. What or who got you into DJ’ing/Producing? Since we were teenagers we were attracted to electronic music, especially house music. Over time the willing grew to be a DJ and produce this kind of music ourselves. We met each other and started this project. We basically found out about each other on Soundcloud and decided to work on something together. It turned out to be Rude Vinyl! What inspired you to make ‘In My Eyes’? Andrei came with the idea, he wanted to mix some deep beats and in the meanwhile not get too far away from the house music style. So shortly this is how ‘In My Eyes’ was born. What kind of hardware/software do you use? We work on PC’s, and we use diverse software (depending on what we are working on). We mainly use Ableton Live 8. Do you have any favorite plugins or other tools you are willing to share with us? We use some stuff from Native Instruments and Sonalksis. The best EQ for us is the Fab Filter Pro Q. It’s hard to say which is our favorite because we use a lot of products from different developers. Do you have other releases coming up soon? We have recently signed a lot of tracks and we just can’t wait for the releases. The soonest release will be in March. What was your best, most fun or weirdest experience so far as a DJ/Producer? Adrian was playing the decks at night while suddenly all the lights go out. Fortunately the people were trying to keep the atmosphere, singing and flashing with their mobile phones. Technical issues can happen to anyone so we were very pleased with the crowd as they gave us the chance to go on with the gig because they kept the party mood going. Who would you like to, or hope to work with in the future? We produce several styles of music so this is a huge variety of people. Of course everyone would want to do a collaboration with the big names. A few on our list are Jamie Lewis, Dr. Kucho and Chocolate Puma. But we could go on and on because there are many other producers and artist we would like to work with. Do you have any tips, tricks or suggestions for upcoming talent or other DJ’s/Producers? We would like to suggest them to always be original, stick to their sounds and of course to be persistent and hardworking to develop their skills! Just to stay tuned for our new releases and we would like to thank our listeners for their support. Also thank you for promoting our release. And of course we at Döner Records thank the guys from Rude Vinyl as well, for the interview and their music! Their track ‘In My Eyes’ is still available at Beatport and all other major portals!